You're suited up in protective apparel, but it feels good. Comfortable. Dramatically softer. And four times as breathable as traditional Tyvek®. Yet it gives you all the protection and durability you've always trusted Tyvek® to deliver. Barrier Protection You Can Trust! Feels like casual wear. Performs like Tyvek®. To you, New Tyvek® feels like casual wear. To dry particulate, it seems like a suit of armor. Look at it from a particle's point of view. Imagine trying to squeeze through a maze of randomly interconnected filaments. You can't get through. Where ever you turn there's another filament blocking your way. No wonder Tyvek® is the industry standard for dry particulate barriers. And by using an advanced patented technology and finer filaments, DuPont has improved both the airflow and the softness of Tyvek® without sacrificing barrier protection. You know dry particulates are not only irritating, they can be hazardous. 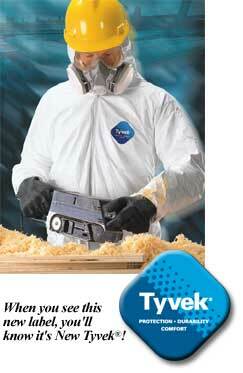 Keep particulates in their place with New Tyvek®. Comfort You'd Never Expect from Protective Apparel. Increase the breathability. Multiply your comfort. Even when you're standing still, your body radiates heat and moisture vapor. So it's no surprise that working in protective apparel that can't breathe escalates the problem dramatically and can affect productivity. It's called heat stress. And it can seriously compromise your safety, especially in hazardous environments. Tyvek® lets air and moisture vapor pass through. It breathes. That's critical, because breathability is a key factor in reducing the hazard of heat stress. And New Tyvek® is four times as breathable as traditional Tyvek®. That multiplies your protection against heat stress. And it multiplies your comfort, because New Tyvek® fabrics are not only more breathable but have a dramatically softer feel. Get out of the heat. Step into the comfort zone, with New Tyvek®. When you depend on durability, it's a comfort to know you're wearing New Tyvek®. In environments where you need protective clothing, you know you're likely to brush up against something rough or jagged. That can be a brush with danger if you're depending on a protective barrier made with laminated porous film. Because microporous films rely on a thin barrier that can easily be scratched through or peeled off. That can't happen with New Tyvek®. Because Tyvek® doesn't depend on a barrier coating to protect you. Tyvek® is an inherent barrier, through and through. In independent garment testing, New Tyvek® proved to be more than twice as durable as microporous film and SMS garments. New Tyvek is tougher than ever, with a work-to-break that is 25% better than traditional Tyvek®.